Which individual-related data is saved on the CampusCard? 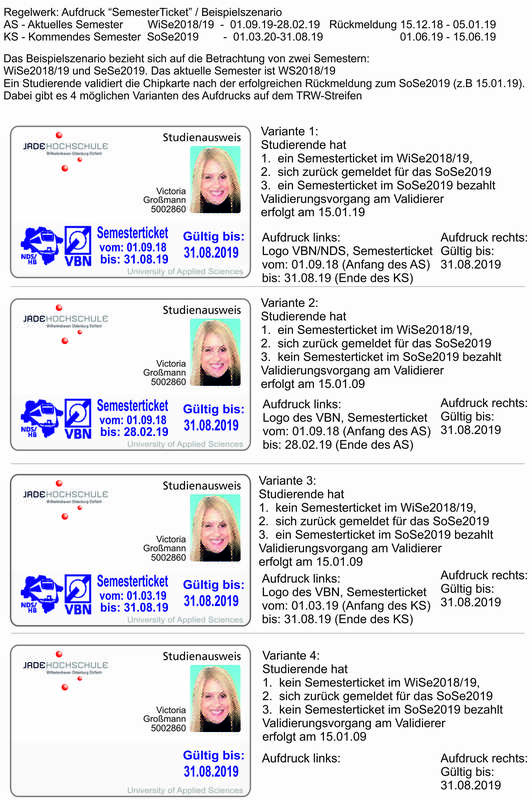 Is it possible to validate the semester ticket in Oldenburg, even if you are a student in Wilhelmshaven? How is the semester ticket pictured on my card? Out of which components is my card made? What is a TRW film? How many times can I validate my CampusCard? How do I activate my library card? How can I upload my picture for the CampusCard? What does the CampusCard cost? How do I lock the card? Do I get to use my semester ticket in the semester breaks / transitional periods? When is the update of the semester ticket possible? The CampusCard you received should always be treated and stored carefully because of its multifunctional purpose (integrated chip, imprint). It is recommended to always keep your CampusCard inside the slipcover that comes with it. Mechanical pressure (bending or curving the card) is to be avoided. If not, the card may be damaged and have malfunctions. In case a replacement card is issued, the costs are to be paid by the user of the CampusCard, if he or she is responsible for the damage. The application of the CampusCard automatically happens when the application papers arrive at the Jade University, except if it is an application for a replacement card. Validating means that the current information are being imprinted onto the CampusCard. This includes new information about the period of validity for the student ID and the semester ticket. You can validate your CampusCard at the validating machines. The student IDs and semester tickets of the Jade University can be validated at every location of the university, irrespective of where you study. This is due to a comprehensive system. The semester ticket function of the CampusCard is pictured on a TRW film on the left of the front side. The period of validity is always supplied with a start date and a terminal date for making sure that the semester ticket is only used as long as legitimate. The CampusCard of the Jade University is made of PVC plastic with ISO standard / credit card (86 x 54 x 0,76mm). A MIFARE chip and TRW film are also manufactured. The TRW (thermo-re-writable) film is a component of the CampusCard. There is a two centimeter long stripe applied on the front side, which allows to reapply the current data (semester ticket info, general validity). The rewritable film can be applied up to 500 times. The CampusCard can be activated as a library card in the libraries of the respective university locations. Please ask the library staff to help you. When applying for matriculation, the picture can be directly uploaded in the Jade eCampus. While doing so, you should use the Mozilla Firefox internet browser on your computer, because problems can occur if you use any other browser or your phone. If you would like to upload a picture later in the process, you can do it as described in the following: After logging into the Jade eCampus, go to “Mein Studium” (ENG: “My Course of Study”) and “Studienservice” (ENG: “Student Service”). After that, go to “Meine Daten” (ENG: “My Data”), click “Bearbeiten Sie Ihre Dateien” (ENG: “Edit your Data”). Now scroll down to the end of the page. There you will find an area called “Bild hochladen” (ENG: “Upload Picture”). Upload your picture and click “Speichern” (ENG: “Save”). The first CampusCard you receive is free. If you hand in an application for a replacement card, you may be asked to pay fees (e.g. if you are responsible for the damage). You can also apply for the lock of your CampusCard online via our helpdesk. The issuing of the replacement card only happens after a successfully initiated lock. Therefore, it is necessary to fill in the application. If the owner is responsible for the loss or damage of the first CampusCard, he or she must pay 15,00€ to get the replacement card. Potential money left on the old CampusCard (wallet) can be handled in a seperate process by the student union in Oldenburg. Yes. The period of validity is pictured in two periods, which follow the other directly (e.g. from September 1st 2010 to February 28th 2011). The validation of the card should happen after the matriculation for the next semester is fully completed and in advance of a potential depart for the time of semester break. Already ten days after termination of the period of time you get to rematriculate, it is possible to update the info of your semester ticket for the subsequent semester. In this case, there might be a problem with the chip number of your CampusCard. Its purpose is to allocate the print order to the user. Please visit the computing centre and ask for help. This indicates that the card has a lock flag on the electronic wallet. This leads to the card being denied at all machines, which communicate with the wallet function (printing terminals, washing machines, cup machines, canteen cash registers etc.). In this case, the card needs to be neutralised where it was used last (vending machine, cash register, terminal or cup machine).